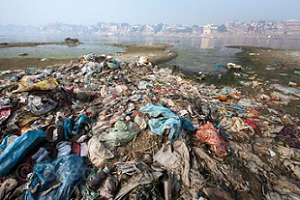 Despite certain steps undertaken for controlling land pollution, there isn't much changes in the environmental condition caused by the polyethylene wastes (Fig. 1). Global production of plastics is about 310 metric tons per year that need to be consumed to prevent further environmental losses. About 1.15 km length of road covers 9000m2 of area, which requires about 600 tons of bitumen. Adding 50% polyethylene would allow us to give space for 300 tons of polyethylene. 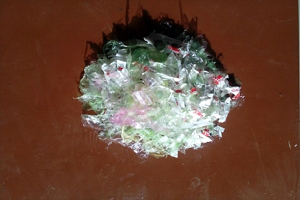 Shredded waste plastics may be used along with bitumen for road construction (Fig. 2). The idea behind our project is to use optimized mixture ratio of polyethylene and bitumen with gravel in the construction of road instead of conventional mixture of bitumen with gravel (control). Generally, about 10% of Bitumen is mixed with 90% gravel (by weight) for normal road construction. Our idea focused on using about 50-50 mixture ratio of polyethylene and bitumen and further using it with 90% gravels in the construction of road to reduce the effect of so called plastic pollution. The toughness of plastic filled gravel is more that only bitumen filled gravel though the elastic modulus slightly reduce in plastic filled gravel (Table 1). Thus, our work demonstrate the use of waste plastic for road construction by reducing the plastic pollution at lower road repairing cost without the bad effect (as evident from no distortion of repaired busy road even after six months). Table 1: Comparison of mechanical strength of plastic filled gravel with conventional bitumen filled gravel (control). Thus, our developed material demonstrate the efficacy of road repairing material where 50% waste plastic can be used which will reduce the plastic pollution along with lower cost of road repairing. This idea may be extended to road construction as well using waste plastic at large scale. 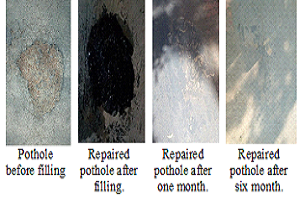 Figure 3 shows images of the 'pothole' and 'filled pothole' by using mixture of polyethylene and bitumen with gravel at different time interval up to six months which clearly demonstrate that no pothole generated over the repaired pothole or in other words there is no damages on the repaired potholes and act like repaired with conventional bitumen treated road repairing. To understand the strength of plastic mixed bitumen against pure bitumen, tensile tests were performed with gravel mixture. Figure 4 shows the stress-strain curves of plastic filled construction materials vis-a-vis only bitumen filled gravel (control). Fig.4 : Stress-strain curve of 'Bitumen with Gravel' and 'Polyethylene + Bitumen with Gravel'.